Although the D&D phenomenon started with wargamers and quickly spread to college goers, children also flocked to the game. Almost everyone I knew in elementary school played it. The very original D&D rules were confusing even to hardened wargamers, and the AD&D books were extremely dense and written in a curious style. What largely formed the gateway for kids was "basic" D&D, first that of J. Eric Holmes, then later by Tom Moldvay and then Frank Mentzer. That child friendliness was lost in more recent editions, which was marketed essentially to existing gamers (at least in my opinion). 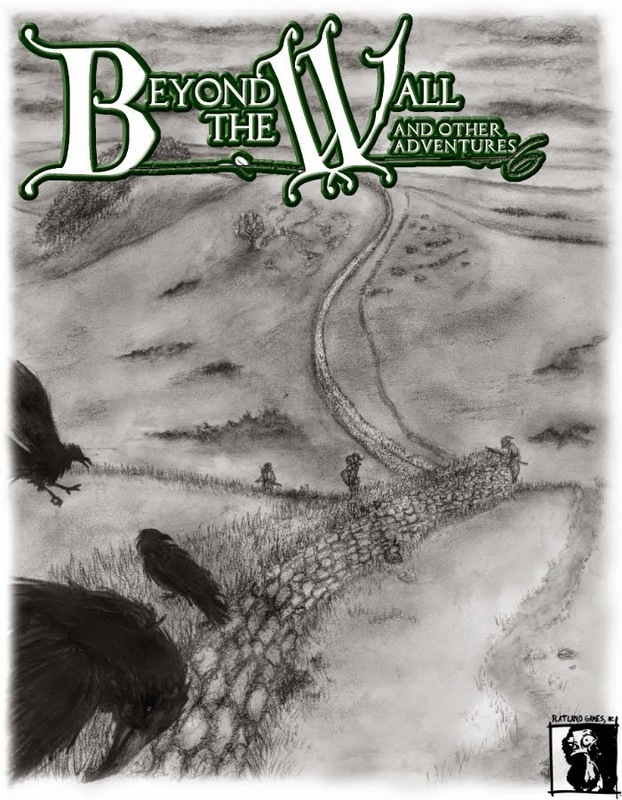 Beyond the Wall and Other Adventures from Flatland Games is an attempt to not only reverse that trend of child friendliness, but to actually make a game for children and young adults. That's not to say childish, but trying to capture the feel of young adult fantasy literature, where a young person is thrust into adventure along with his friends. At its core, Beyond the Wall is a fairly simple version of old school D&D using base attack bonus and ascending armor class. There are three classes: warrior, rogue, and mage. This sounds simplistic, but a character's background can change this dramatically (giving a class "knacks" in the case of the warrior, or skills for all the classes), and in some cases, there are mult-class types. Character generation is done using a playbook that contains a fairly simple life path system. That is, you randomly roll your character's background, which generated the skills and abilities scores for your character. Each playbook has different tables, and there are a large number of playbooks to choose from. What's more, is that you don't just create your character with the playbook, you help create another player's character as well. This also serves to tie the characters together as friends. And the playbook isn't just used for character generation, it has all the rules needed to play, really. The warrior is close to the standard old school fighter, no special abilities, but the best at fighting and can use all weapons and armor. He also gets a "knack" every other level, which is something akin to the feat from 3e. Basically a +1 bonus to initiative, damage, AC, or saving throws, or a specialization in another weapon (warriors start with specialization in one). Lastly the is the mage, taking the role of both the old school magic-user and cleric. So this is probably where it diverges the most from regular D&D. It mostly follows the magic-user, not being able to wear armor, but has a few healing spells. The magic system is vaguely Vancian (that is, like regular old school D&D), but not very. Characters can cast as many spells per day (that they know) as their character level, but can cast as many cantrips they like as long as they make a roll. Once that fails, they are worn out and can't cast any more cantrips until the next day. There are no limits on how many spells they know, but they have to see if they can learn them. Cantrips are generally weak, but useful. Spells are pretty much the equivalent of 1st or 2nd level spells in traditional D&D and include things like burning hands, magic missile, and spider climb. But also cleric ones, like healing and turning undead. Most are renamed and rewritten, and it uses a simplified range system of near, far, touch, and self. There are also more powerful spells, rituals, that take a long time to cast and so aren't suitable for combat. Unlike spells, these are divided by levels, from 1 to 10, and many are standard D&D spells, such as Unseen Servant, Continual Light, and so forth. They require an hour per level to cast, and you have to be be that level to cast that ritual. While the idea behind this is pretty nice, at the same time, I'm not sure how practical it is for gameplay, because it basically ties up a character for several hours of game time. What are the other players supposed to do while that character is casting the ritual? Rest in some cases, but still. Although there is some traditional GM material (a bestiary of monsters and advice and so forth), adventures are presented in unusual manner, similar to that of the playbooks for characters. Basically in a "scenario pack" you are given useful information and tables and sort of walks you through making an adventure much like the playbooks do for making a character. The downside is that there is only one scenario pack that comes with the game, although there is one more free one. If you want to make more adventures, you are almost on your own. It is simple enough to use most other OSR modules (Basic Fantasy in particular as it also uses ascending AC), but they do lack the focus on the village that Beyond the Wall has, which is part of the game's charm. It seems like everyone and their brother's sister's cousin is putting out their own RPG and/or retro clone. Most actually do have something new or different that they offer, but few make me say "Wow, I really want to play (or run) this!". Beyond the Wall and Other Adventures really does, especially to roll up characters. On the other hand, once you run out of the scenario packs, or if they don't strike your fancy, you are left without much support in creating adventures. For a long time GM, that's really no problem, but for a game aimed at beginners, it's something of a flaw. However, apparently Flatland Games is working on a GM's guide of sorts. Still, it really captures the magic of role-playing.